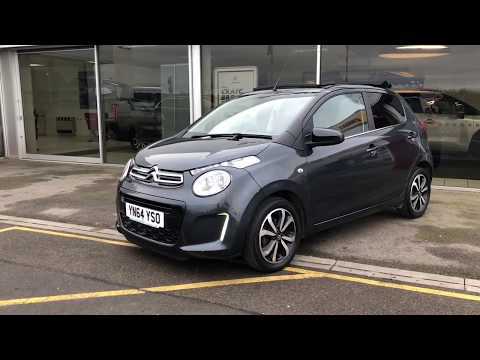 Introducing to Croxdale Citroen, meet this great little 64 plate C1 Flair AirScape finished in a desirable and smart grey with cloth interior. The C1 is a fantastic little vehicle perfect for city travel or an ideal first car. The Flair edition come equipped with a variety of specification designed to make your drive more comfortable and enteraining including; reversing camera which is displayed on a 7in touchscreen monitor, cruise control with speed limiter, DAB radio with USB and AUX ports, electrically adjustable door mirrors and electric windows. Buy with full peace of mind knowing you will receive 12 month Citroen warranty, 12 month roadside assistance and 30 days exchange programme. This car is available to view and test drive at Croxdale Citroen Durham, our Citroen experts will ensure you receive a fantastic experience. With up to £500 deposit contribution towards your new Citroen with PSA finance at 10.9% APR. We also have a range of finance options available from no deposit across our used car range. Buy from Croxdale Citroen and you will have full peace of mind of a pre-sales inspection by Citroen trained technicians. We have been an established Citroen dealer since 1967 and we are based on the A167, Durham - 5 miles from Durham City Centre. Let our family look after yours - Call our team on 01388 814671 - we look forward to helping you purchase your new Citroen.